In this photo released by New Zealand Department of Conservation, the department's workers clear perished pilot whales after a stranding in Owenga, Chatham Islands, New Zealand, Friday, Nov. 30, 2018. Fifty-one pilot whales died Friday in another mass stranding in New Zealand, less than a week after 145 pilot whales and nine pygmy killer whales perished in two other, unrelated stranding. 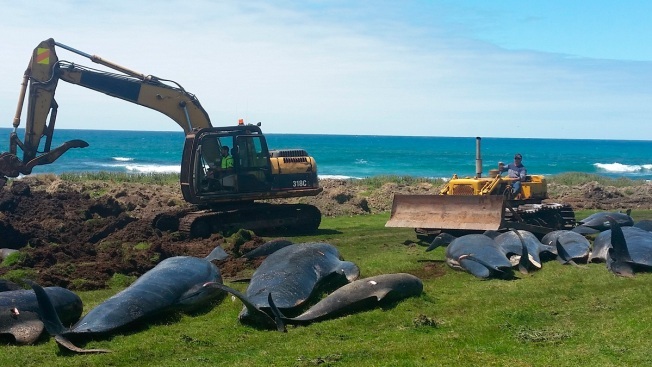 Fifty-one pilot whales died Friday in a mass stranding in New Zealand, less than a week after 145 pilot whales and nine pygmy killer whales perished in two other unrelated strandings. The Chatham Islands are about 800 kilometers (500 miles) east of New Zealand's main islands and are home to about 600 people. "You're talking about strandings across the entire breadth of New Zealand in a very short period of time, which naturally does cause everyone to reflect on whether those might have something to do with one another," he said. Lundquist said that while scientists don't typically know why individual whale strandings occur, they believe there are probably a range of reasons. He said they could be caused by whales navigating incorrectly, trying to escape from predators, or some of them suffering injuries or illness. He said there could also be man-made factors like underwater noise. "In many of those cases, it's probably a combination of those factors," he said.